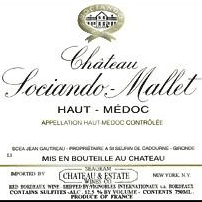 Chateau Sociando-Mallet 2010, 6 bottle case, Haut-Médoc cru bourgeois, The deep ruby 2010 Sociando Mallet is a very classy wine with intense aromas of violets, cassis, blackberries and plums. Sociando Mallet Chateau is a vast vineyard located in Saint-Seurin-de-Cadourne in the Haut-Medoc , on the edge of Gironde and in the immediate vicinity of the Saint-Estèphe. The first owner of the premises was a Sieur Sociando in the first half of the 17th century. In 1850, Jean Gautreau who owns the domain.